Map Ref: SJ 852422 shows detailed map. Ferndown LNR is located in Clayton, Newcastle, on the northern edge of Stafford Borough near junction 15 of the M6. 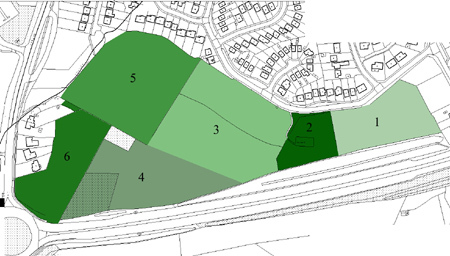 The area of land is approximately 5.5 hectares and is broken up into six compartments comprising of old agricultural fields whose hedgerow boundaries still divide the site today. The main habitats on site are meadow and scrub woodland. A five-year management plan exists for the site which aims to restore the condition of the meadows, providing a greater variety of wildflowers that will in turn support many invertebrates such as butterflies and moths. The scrub area supports many species of bird and the recently formed Friends of Ferndown group have created a feeding station for them. Species seen include Bullfinch, Siskin, Goldfinch and Great Spotted Woodpecker. Part of the site, an old paddock field includes a Biodiversity Alert Site noted for its botanical interest. Plants on site include Common knapweed, Meadow vetchling, Cuckoo flower and Broad-leaved Helleborine. If you would like to join the active Friends of Ferndown LNR contact an officer through the Friends of Ferndown website.